Non-enveloped, head-tail structure. The capsid is 67 nm in diameter, with a T=7 icosahedral symmetry . The major capsid protein and the decoration protein each have seven copies or conformers in each asymmetric unit, the decoration protein forming dimers bound to the underlying major capsid protein shell. The short tail is non-contractile, has 6 prominent tail spikes and six long tail fibers, each with a globular distal end. 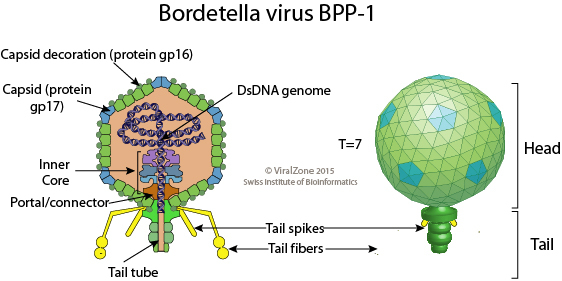 The tail spikes are attached to the capsid shell without direct connections to the central tail hub. Linear, dsDNA genome of about 42 kb encoding for 49 genes.